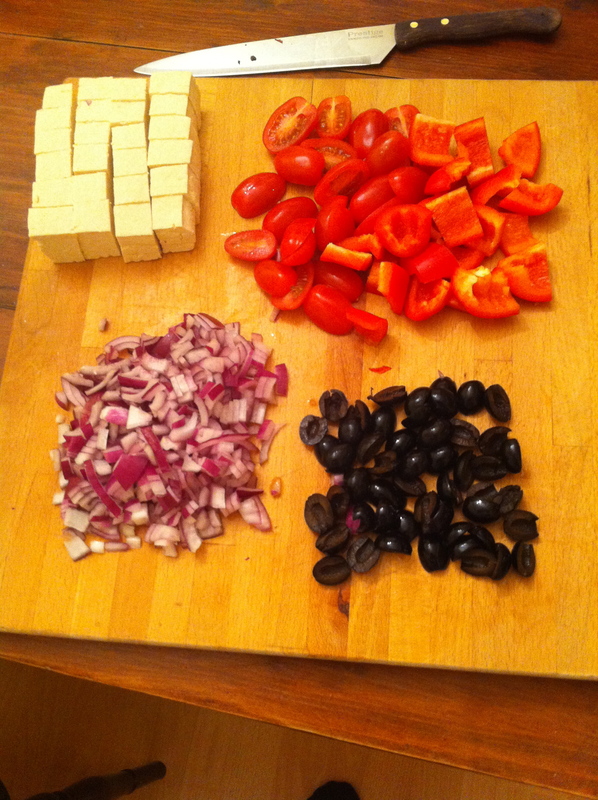 I wanted to make something nice for dinner based around one key ingredient – tofu. 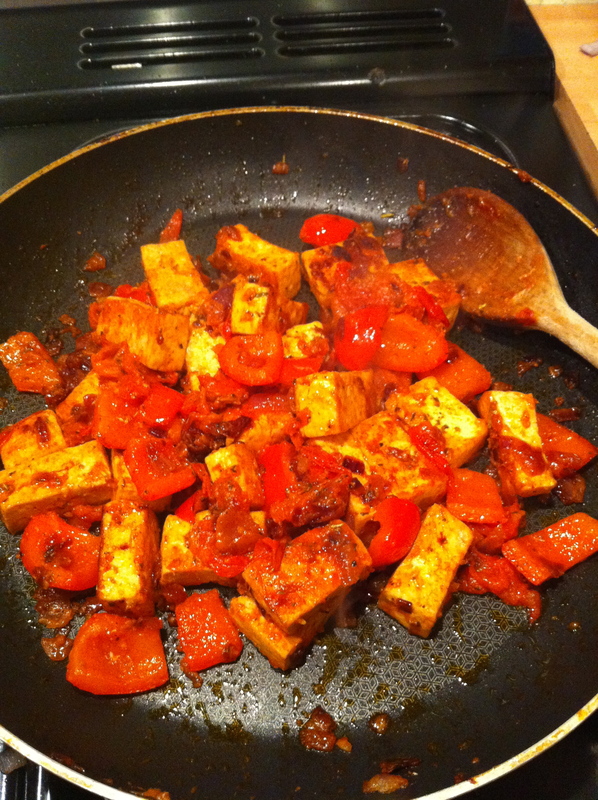 We have cooked with tofu a few times but I’m keen to start using it a bit more as I’m getting sick of all the Quorn products; there’s so much that can be done with tofu that it’s a lot more versatile. Plus, it’s delicious! 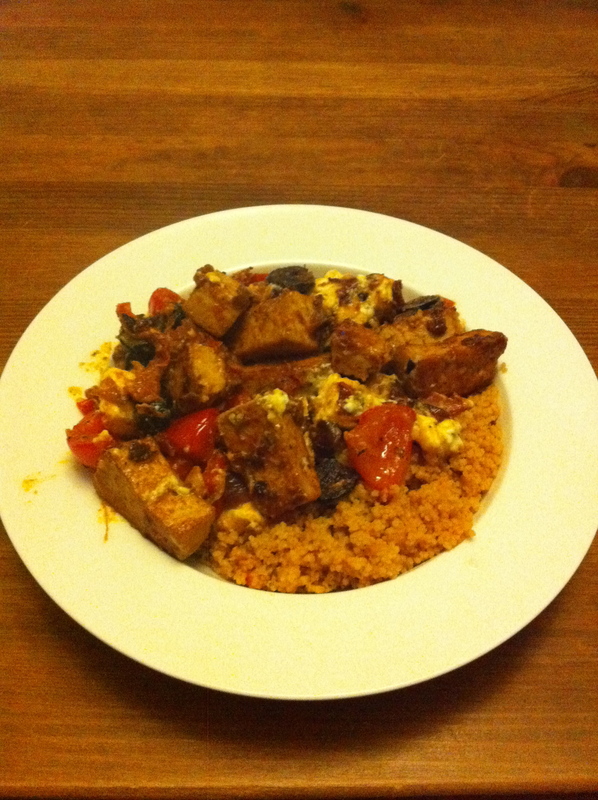 I found a delicious sounding recipe on Post Punk Kitchen (Puttanesca Tofu Scramble) that called for very few ingredients so I decided it would be the perfect easy Thursday night dinner. We already had peppers, tomatos and onions so I just nipped to Sainsburys and grabbed tofu, olives and a bit of an impulse buy of feta cheese. 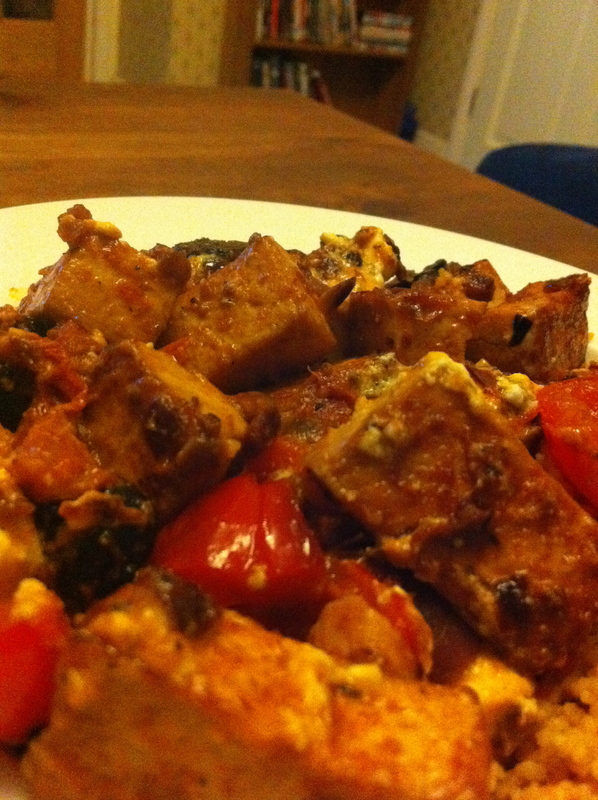 We’ve never pressed our tofu before cooking with it and I decided this was the night to try! It was really easy to do; we opened and drained the tofu (we used Cauldron Firm) and put it on a dinner plate on top of a few sheets of kitchen towel. We then topped it with another plate and a load of heavy cooking books. When we returned 20 minutes later a good amount of liquid had been squeezed out and the tofu had a firmer, spongier appearance. Marvellous! Drinks in hand (it had been a long day…) we then started chopping the ingredients. 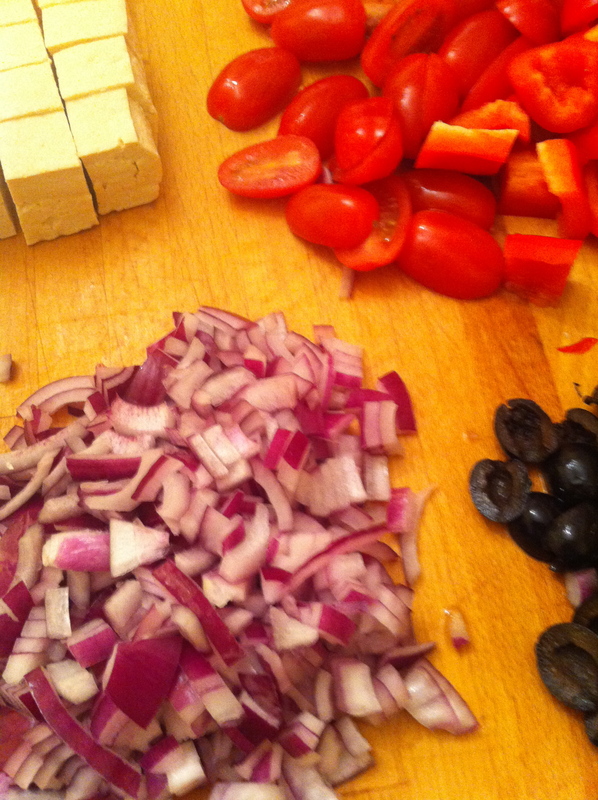 When the tomatoes and peppers were at a level of softness that satisfied me, we added the sliced olives and finally the feta. I was umming and ahhing about whether to add the feta into the pan or just on top at the end but I’m so glad we added it in! Some of the smaller chunks melted fully, binding all the ingredients into a kind of salty, cheesey blanket, while the bigger pieces remained valiantly whole, delicious when unexpectedly muscling in on the odd forkful. 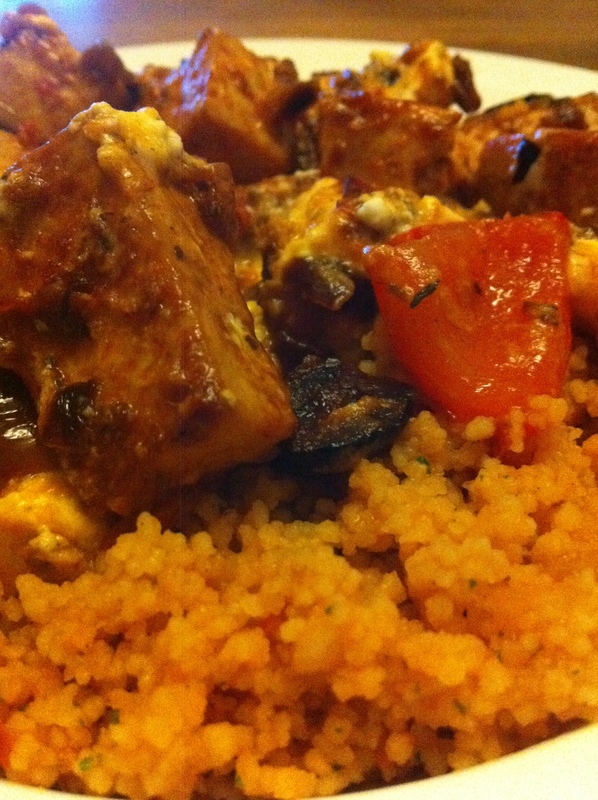 We served the ‘scramble’ with some sun-dried tomato couscous which really was the perfect accompaniment. This was a really delicious, easy dinner that came together in no time, we’ll definitely be making it again!